For the past few weeks, I have been doing literature researches on the different types of colour-changing materials. The types of materials and their influential factors are listed in the table below. As we are focusing on the non-emissive display on the fabric, the main types of materials we can work on in the later stage will be thermochromic inks and electrochromic materials which seem to be more feasible as a controllable colour-changing display. Electrochromic materials can change their color when a potential is applied due to electrochemical oxidation and reduction. Current available technologies employ inorganic electrochromic materials, such as WO3. However, this transition metal oxide electrochromics show a slow response time (tens of seconds) and high processing cost. Smart Sunglasses have been built from electrochromic materials. 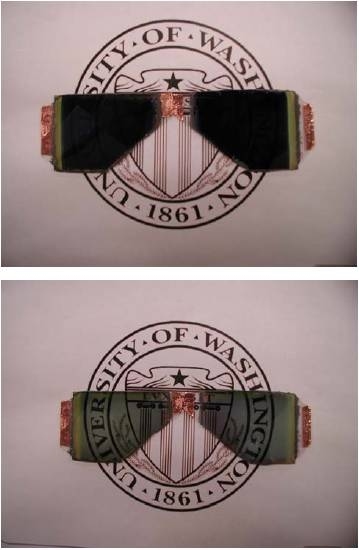 The following shows an example of the smart sunglass which has been done by the researchers from University of Washington. The object is powered by a cell battery, and has its lens change its colour when an electrical current is passing through. The device was kept in a colored or transparent state without electric charge for 30 days. The transmittance at 580nm changed less than 6% on the fully colored state and maintained almost no change on the fully transparent state. However, the material seems to be fragile and hard to be mounted onto the clothes. It also poses a potential threat to the human wearing the device if it was to be made on the clothes. For the themochromic ink display technology, there are mainly two type of materials which can be used, naming the liquid crystals and the leuco dyes. Leuco dyes are chemicals displaying a color change (usually between the colorless leuco form and the colored form) in dependence on temperature. The dyes are rarely applied on materials directly; they are usually in the form of microcapsules with the mixture sealed inside. An illustrative example is the Hypercolor fashion, where microcapsules with crystal violet lactone, weak acid, and a dissociable salt dissolved in dodecanol are applied to the fabric; when the solvent is solid, the dye exists in its lactone leuco form, while when the solvent melts, the salt dissociates, the pH inside the microcapsule lowers, the dye becomes protonated, its lactone ring opens, and its absorption spectrum shifts drastically, therefore it becomes deeply violet. - To have a method to control the colour changing effects of the thermochromic inks, most likely will be using a temperature heating/cooling system to have a accurate control over the inks. - To find out the types of colours which can be displayed from the thermochromic inks, and their activation temperatures. - To find out whether mixing of the colours can be done. This is to display a variaty of colours on the same piece of fabric, instead of carrying on with the old method of changing from colour to colourless. - To find whether there are other display methods for non-emissive fabric colour display and their controlling methods.